This set of Geotechnical Engineering Mcqs focuses on “Plastic Equilibrium in Soils : Active and Passive States”. Explanation: The theory of plasticity pertaining to soils is based on Mohr’s theory of rupture. 2. On designing retaining walls it is necessary to take care of __________ exerted by soil mass. Explanation: In the designing of retaining walls; sheet piles or other earth-retaining structures, it is necessary to compute the lateral pressure exerted by the retained mass of soil. Explanation: The material retained or supported by the structure is called backfill which may have its top surface horizontal or inclined. Explanation: When the soil is at elastic equilibrium(i.e. at rest) the ratio of horizontal to vertical stress is called the co-efficient of earth pressure of rest. Explanation: The theory on which the computation of the stress in a state of plastic equilibrium is based is called the theory of plasticity. Explanation: During the active state, the wall moves away from backfill and a certain portion of the backfill in wedged-shaped tend to move which is called a failure wedge. 7. In active stress, the major principal stress σ1 acting on the wall will be in __________ plane. Explanation: In an active state, the major principal stress σ1 is vertical and the minor principal stress σ3 is horizontal. Explanation: The plastic state of stress when the failure is imminent was investigated by Rankine in 1860. Explanation: The position of the backfill lying above a horizontal plane at the elevation of the top of a wall is called the surcharge, and its inclination to the horizontal is called surcharge angle β. 10. What will be the co-efficient of passive earth pressure, at a depth of 8m in cohesion less soil sand with an angle of internal friction of 30° when the water rises to the ground level? 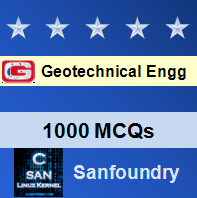 To practice MCQs on all areas of Geotechnical Engineering, here is complete set of 1000+ Multiple Choice Questions and Answers.